Romantic high fantasy from the bestselling author of Star Wars: Ahsoka and Exit, Pursued by a Bear. It's been a year since the mysterious godsgem cured Cadrium's king and ushered in what promised to be a new golden age. The heroes who brought home the gem are renowned in story and song, but for two fellows on the quest, peace and prosperity don't come easily. Apprentice Knight Kalanthe Ironheart wasn't meant for heroism so early in life, and while she has no intention of giving up the notoriety she's earned, reputation doesn't pay her bills. 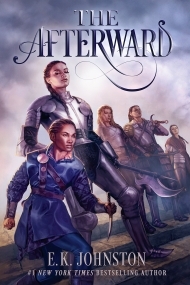 Kalanthe may be forced to betray not her kingdom or her friends, but her own heart as she seeks a stable future for herself and those she loves. Olsa Rhetsdaughter was never meant for heroism at all. Beggar and thief, she lived hand to mouth on the streets until fortune--or fate--pulled her into Kalanthe's orbit. And now she's reluctant to leave it. Even more alarmingly, her fame has made her profession difficult, and a choice between poverty and the noose isn't much of a choice at all. Both girls think their paths are laid out, but the godsgem isn't quite done with them and that new golden age isn't a sure thing yet. In a tale both sweepingly epic and intensely personal, Kalanthe and Olsa fight to maintain their newfound independence and to find their way back to each other. It's been a year since a team of knights, a mage, and a thief defeated a great evil. Hope sprung anew in the people, a king was healed, and a wedding had. But life didn't stop there, and not all was happy. Two of the team, Olsa and Kalanthe are struggling. Olsa, once the greatest thief of the city, can't finish a job anymore because everyone knows her face. Kalanthe is about to be made an official knight, but with that comes her duty to marry someone wealthy. While the two fell in love during the quest, the odds of a happy ending for them seem impossible. But some ends remain loose and in their paths to finish what was started, there's no telling where the roads will take them. As with all of E.K. Johnston's books, there is plenty to love about THE AFTERWARD. Olsa and Kalanthe have a beautiful relationship, and even as all seemed lost, I was rooting for them to find a way back to each other. Like all great romances, the tension, the seemingly insurmountable odds kept me turning the pages as fast as possible. While both timelines were fun to follow, I particularly enjoyed the Before chapters between them, as they slowly got to know each other. As much as I loved the romance and the premise of focusing on the 'after' in a fantasy novel, the characterization left me wanting more. I felt like Olsa and Kalanthe each had wonderful potential for strong character arcs that ultimately didn't quite deliver. Rather than confronting inner conflicts, things seemed to work out around them without much of their own involvement. While I loved that for the romance, it made me feel that neither character grew as much as she could as an individual. Though The Afterward didn't fully satisfy, E.K. Johnston has nonetheless created a unique and engaging world with memorable and highly lovable characters.